Home » Latest Articles » Music Theory » Why Learn Music Theory? 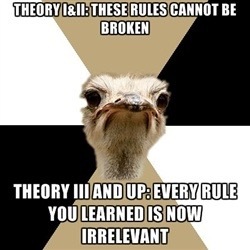 Music Theory… that dreaded subject! It seems to divide opinion more than many other subjects in music. It will ruin my creativity, I don’t like rules, its too complicated etc. To a certain extent I agree with the above. I don’t like rules, but rules are there to be broken, but, if you don’t know the rules you don’t even know you’re breaking them, it’s much more fun when you know you’re being naughty! It will ruin my creativity. Well, music theory actually serves various purposes. One of the most important is that it gives us a set of terms that allows us to write things down (I forget loads!) and also allows us to communicate effectively with other musicians so we all know what we are taking about. After all saying ‘play a G chord’ is music theory! Music theory is changing all the time as we adapt to new forms of music that broke the previous set of rules, theory in the 16th century would have been very different to today! It is the cumulative effort of lots of people analysing music and trying to work out what ‘sounds’ good and why (rather them than me!!). We can take advantage of the work that has already been done to help us work out what to do or play next, what will sound right. You could just keep experimenting, looking for the next chord that sounds right, but usually that chord turns out to be the one that music theory says would sound right anyway! So music theory saves time and hassle, double win!